Since August, I’ve been sharing some of the changes we’ve made or will be making in the preschool this year. Change is necessary for growth, but oftentimes change is hard. 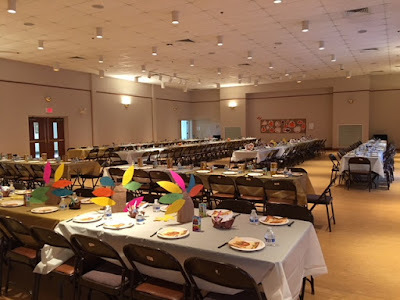 There’s a poster hanging in my office that reminds us of this: “Change is Hard at First, Messy in the Middle, and Gorgeous at the End.” But not all things necessarily require big changes, and the preschool’s annual Community Thanksgiving Feast is one of them. Last year, I was blown away by this event. At first, I didn’t believe we could pull it off, but by the end, I was already looking forward to the next one. First, we invite all our families, including siblings, grandparents, and caregivers, so it really is a community event. Approximately 200 people attend, and we have to feed them all. The children do all the cooking, and each class makes a specific dish to share: mashed sweet potatoes, green beans, succotash, corn bread, apple sauce, cranberry sauce, and dessert. Families donate the ingredients, and it takes us a whole day to do all the prep work and baking. Personally, I found making the mashed sweet potatoes to be the most fun. After roasting the potatoes whole, the skin peels right off. As for the next step, just hand potato mashers to a group of three or four-year-olds and stand back. They’ll figure out what to do without you having to explain much. Add some butter, brown sugar, and cinnamon, and you have a genuinely delicious dish that received rave reviews from those in attendance last year. In order to seat 200 people, we have to take over the social hall. It’s filled with every long table the synagogue has, and each of those tables must be decorated. Each class makes table decorations (which each child will take home after the feast to hopefully grace their own Thanksgiving table), ranging from cornucopias to turkeys to pieces that incorporate natural elements such as acorns or autumn leaves. Volunteers come in the night before to set up the room and set the tables. It’d be impossible to get the job done without our amazing parents.